« Why are NAND Flash Fabs so Huge? 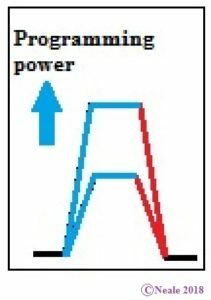 Here’s the issue that this approach addresses: Quenching is an essential part of PCM operation, since quenching is necessary to “freeze-in” the amorphous state. So far most memory array designers have achieved quenching by bringing only a small volume of molten material to a high temperature and then cooling it by using any naturally-occurring low thermal resistance path to the local heat sink. Past efforts at thermal design have focussed more on trying to avoid thermal cross-talk which itself has the tendency to come in conflict with achieving high quench rates. While lithographic scaling produces an effective heat sink it also reduces the size of the molten volume and a smaller molten volume requires a very high RESET current to reach the melting temperature. The high RESET current exacerbates the problems of element separation for multi-element PCM compositions. 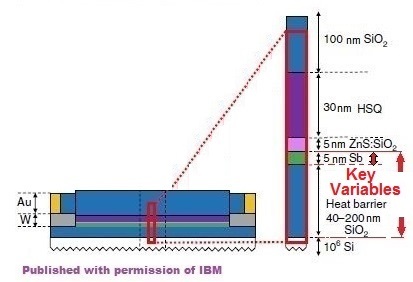 IBM’s researchers chose to design a pure antimony cell with a lateral structure that allowed them to control the volume of the antimony while also giving them control of the thickness of an underlying SiO2 thermal barrier to manage the quench rate. The diagram above shows a side view cross section of the memory cell and the lateral structure used for the new quenching-controlled nanoscale confinement structure. The column at the right is an enlargement of the small zone outlined in red in the cell cross-section on the left. Starting from the bottom, the structure consists of the silicon substrate, an SiO2 heat barrier, the antimony bit layer, ZnS-SiO2 and HSQ layers (both explained below), and an SiO2 capping layer. The red arrows indicate the experiment’s two key variables: The thickness of the antimony and the thickness of the SiO2 thermal barrier between the antimony and the silicon substrate heat sink. 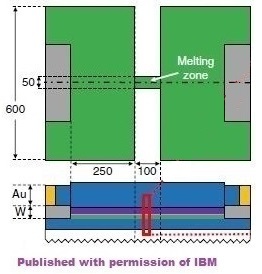 The ZnS-SiO2 layer in this drawing acts as a barrier to protect the antimony during subsequent processing; in the past this same material has been used to protect the surface of PCM-based CD-RWs, so the material is well understood. 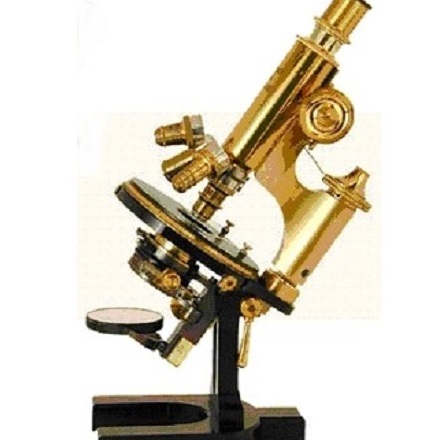 The HSQ (Hydrogen Silsesquioxane) layer above that is a material that is often used in the semiconductor industry thanks to the combination its many useful photo-lithographic, dielectric, and thermal properties. The next figure is based on this same cross-section side view as the figure above. The large green area in this figure is a top view of the same structure’s antimony layer – the thin green layer in the side view. Although the cell is 600nm long in this direction, the melting zone is only 50nm. 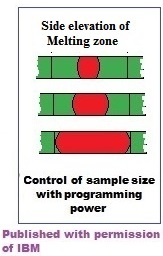 The first two of these are represented in the figure below. 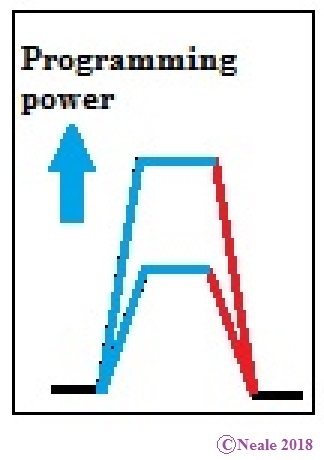 The programming power is indicated by the height of the pulse, and the duration of the trailing edge (red) corresponds to the slope of that line. The figure below is my linearised version of the data from the Salinga paper cited above. 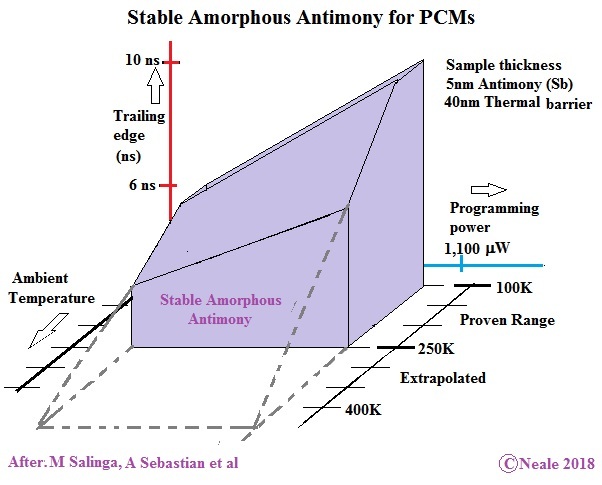 It illustrates how these three variables combine to create amorphous antimony in a cell that pairs a 40nm heat barrier with a 5nm antimony thickness. As long as the ambient temperature and the parameters of the programming pulse remain within the purple area an amorphous state can be achieved. The extrapolation (dashed line) indicates that there should be no sudden drop that would prevent this approach from creating an amorphous state as temperatures rise above room temperature: 295°K. It must be stressed that this chart is for just one thermal barrier thickness (40nm) from an experimental thickness range of from 40nm to 200nm and for one antimony sample size of 5nm. It was reported that, with thermal barriers greater than 200nm, it becomes extremely difficult to produce amorphous antimony. There are three ways to control the size of the heated volume, two are direct by either varying the thickness of the antimony film or by varying the thickness of the thermal barrier, the third is indirect by using the programming power to control the size of the melt region. As the power is increased the width of the amorphous region expands. This is illustrated in the figure below. PCM aficionados will ask two key questions: “What are the on-to-off resistance ratios and what is long term stability?” To date on-to-off resistance ratios of greater than two orders of magnitude have been achieved for the stable amorphous state space shown in the 3D plot above. Although there is some reduction towards higher temperatures, usable on-to-off ratios and retention times are possible at temperatures well above room temperature. This is a dramatic illustration of the important role that nanoscale confinement and interfaces play in effecting very large positive changes in the stability of the amorphous state. Clearly there is much scope for improving retention times with new structures, new interface materials and even smaller volumes of material. The authors of this new work claim they have already reached a performance level for monatomic antimony phase-change memories (Sb-PCMs) which would allow the devices to be used for in-memory computation tasks, with retention times orders of magnitude higher than DRAMs. These first steps towards single-element PCMs have only just scratched the surface. One of the most interesting aspects of this work is the revelation that heated volume, nano-confinement, and interface surfaces all play a role as important variables. These findings have moved us into an area of technology where surface roughness at the atomic level now becomes an important design consideration. Thanks Ron and Thanks Jim, and thank you IBM Research. I watched the video too. Nice work. Good information, and very nice video. Thanks for sharing!